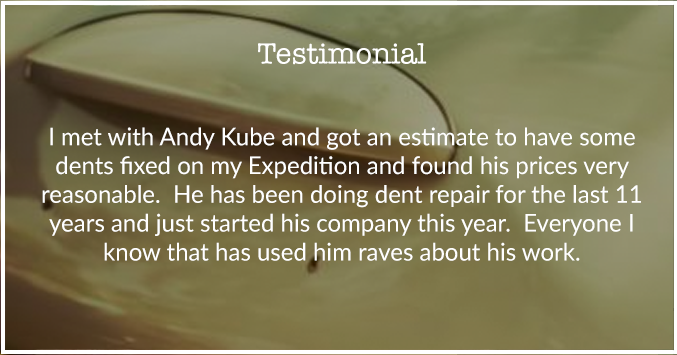 My name is Andy Kube and I own Like New Mobile Dent Repair, LLC of Tucson, Arizona. I’m a Master Technician, trained by the largest global dent company in the world. 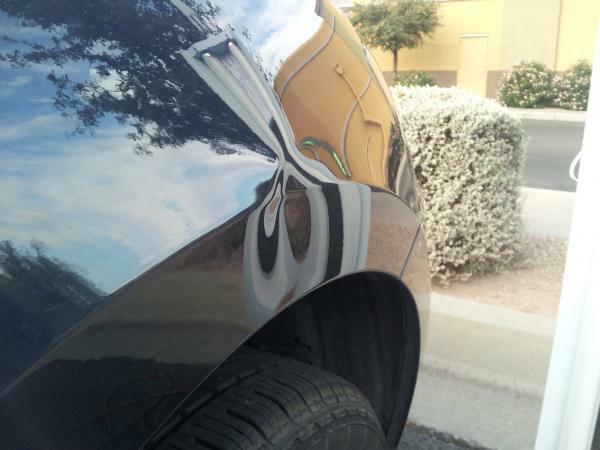 I moved to Tucson in 2001 and have worked in the paintless dent removal business for over 16 years. 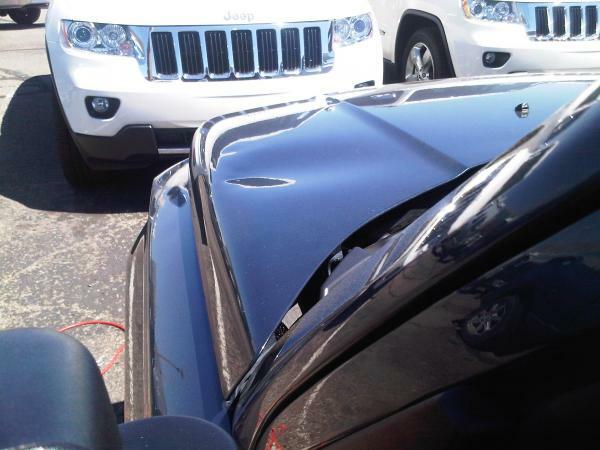 We provide a simple, paint-free solution to repair dents, creases, dings and even hail damage on your car, truck or motorcycle for much less than what a body shop charges. 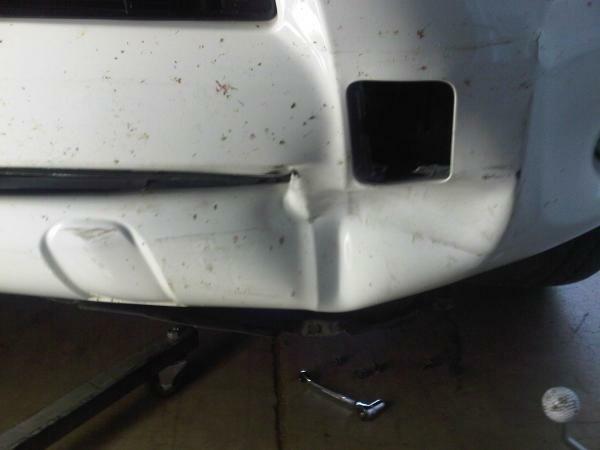 The end result is a complete repair, saving time and money because parts do not have to be replaced or painted. 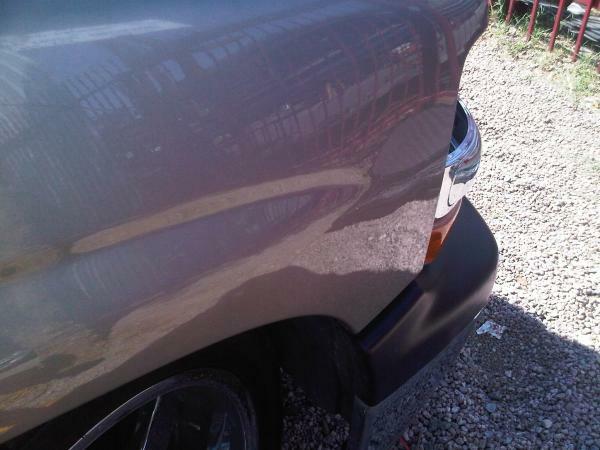 I have been working as a Paintless Dent Repair technician for two years. 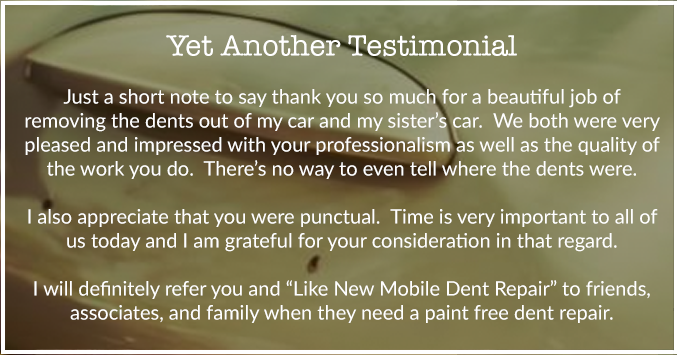 After a six-month apprenticeship with master dent technician Andy Kube, I really felt like I grasped the concept of dent removal on any given situation. 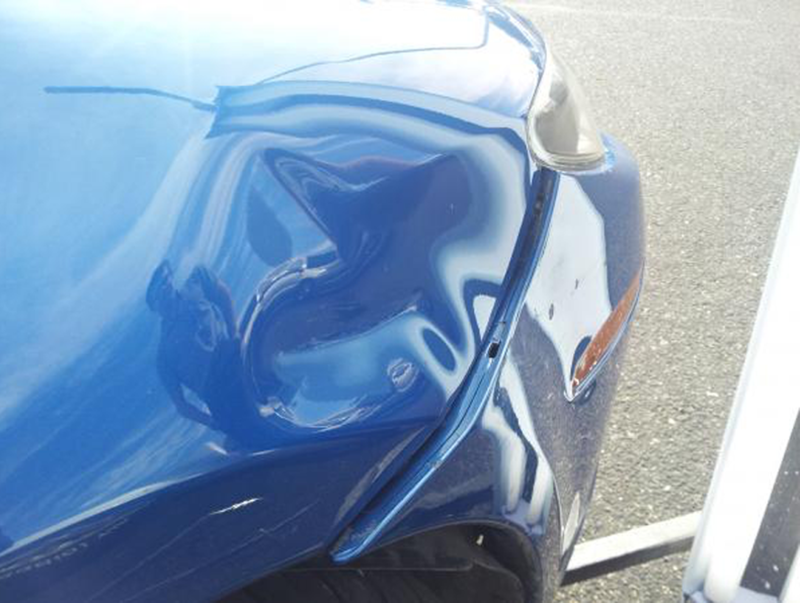 Not only was I taught how to estimate the cost, access the dent and remove the damaged area. I was also taught when our methods were not the best option and trained on who to refer the customer to, giving them the best possible outcome for their situation.I studied fine art, sculpture and metal work in college. I believe this really prepared me for this line of work. I’ve been told numerous times what we do is an art. It takes a steady hand, a critical eye and a lot of patience to get the desired end result. The goal of myself and our entire team is to give our customers the best possible product for a fraction of the cost of a body shop. I’m in Arizona native, born in Tucson and raised in Cochise County. 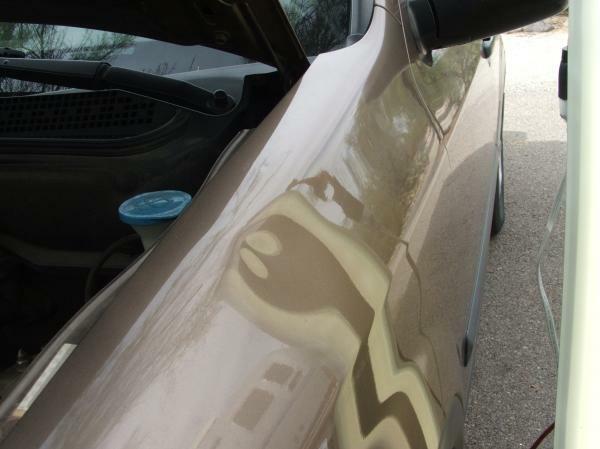 I love having discovered paintless dent repair as a career. Engaging people and making their car look its best is truly a rewarding part of my day every day. 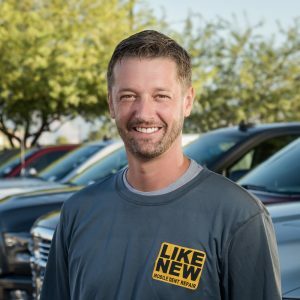 My eight years of insurance background give me a more thorough understanding of repairability and the costs that are saved with paintless dent repair versus traditional bodywork. 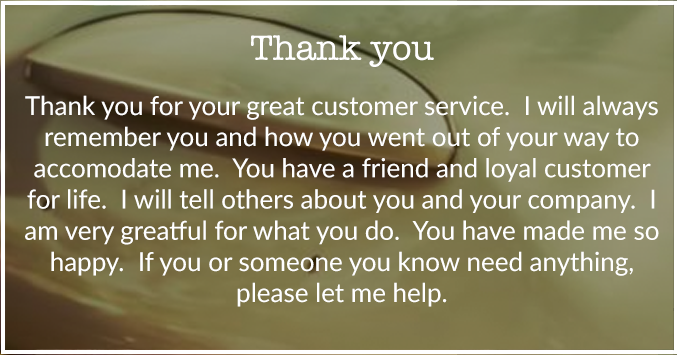 I enjoy putting people at ease with their concerns with repairs and making their day just a little bit better. On my off time, I enjoy spending time with my family, shooting pool and discovering what our beautiful state has to offer. 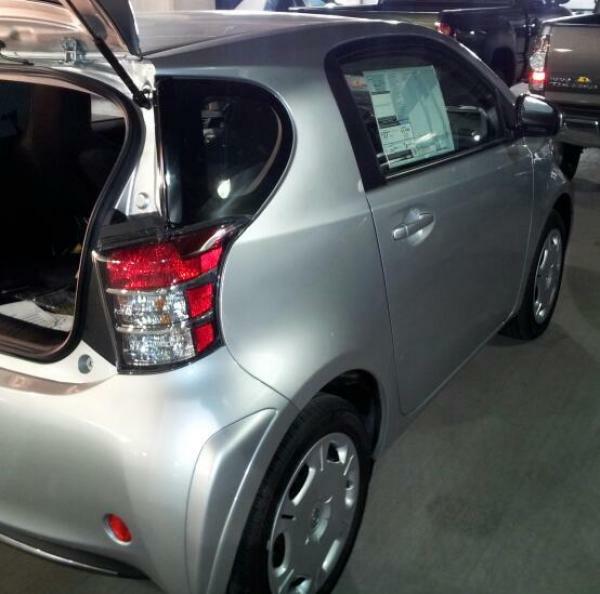 Have you ever come out of a store and noticed that the person parked next to you slammed their car door into your car, leaving a nice dent? 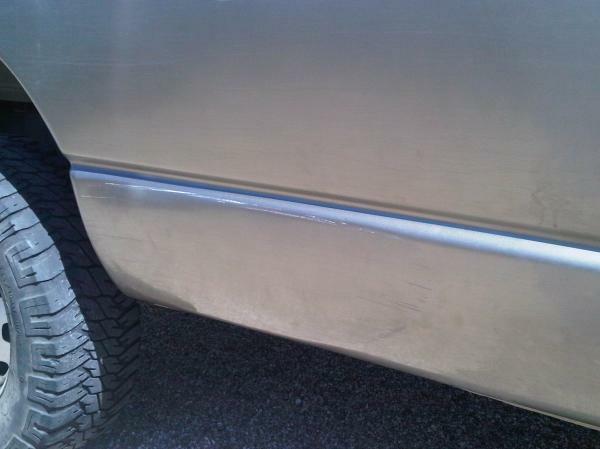 Well, we reshape the dent back to its original form, massaging the metal out with a series of tiny pushes. 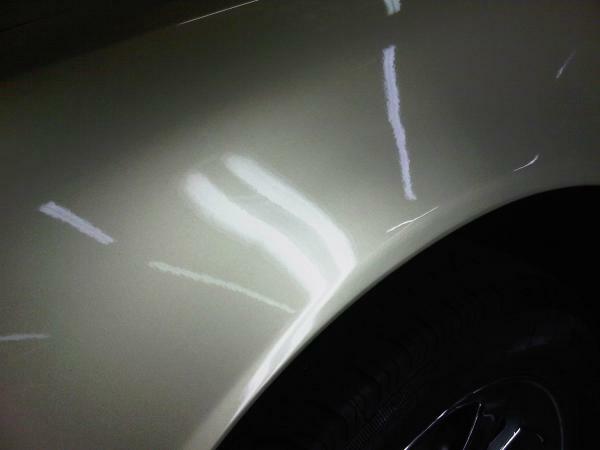 This process eliminates the need for paint, allowing us to fix your vehicle quickly, at a reasonable price. 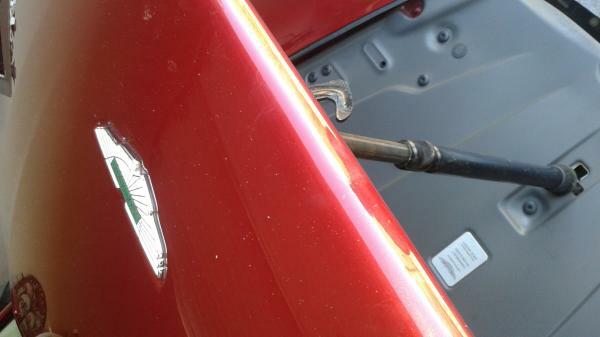 This was a pretty nasty dent, but easily fixed with paintless dent repair. 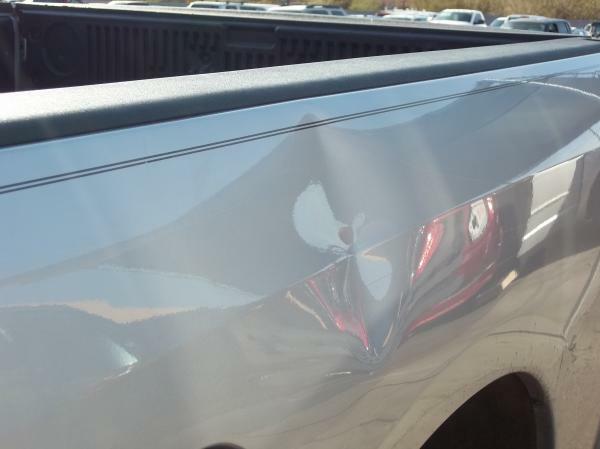 This dent was difficult to repair, being on a curved piece of metal. It looks great now! 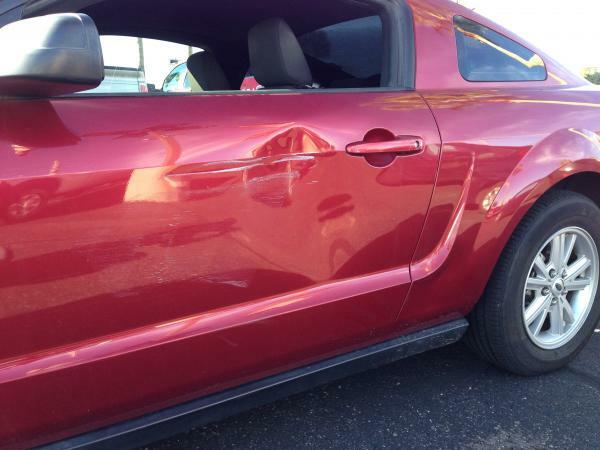 This Mustang was a challenging dent. 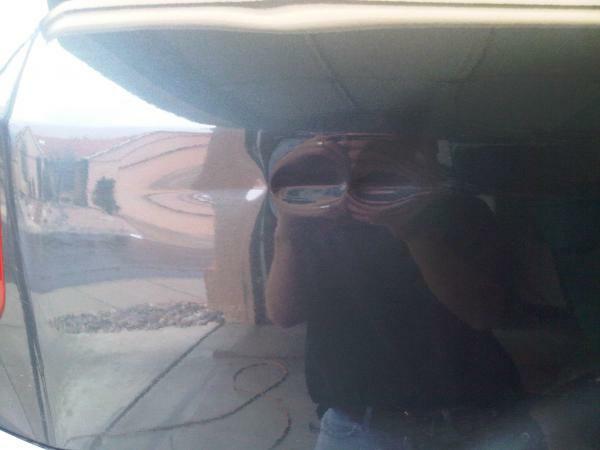 Do you see the paint transfer from the other car? This was a more difficult dent but as you can see, it came out beautifully! 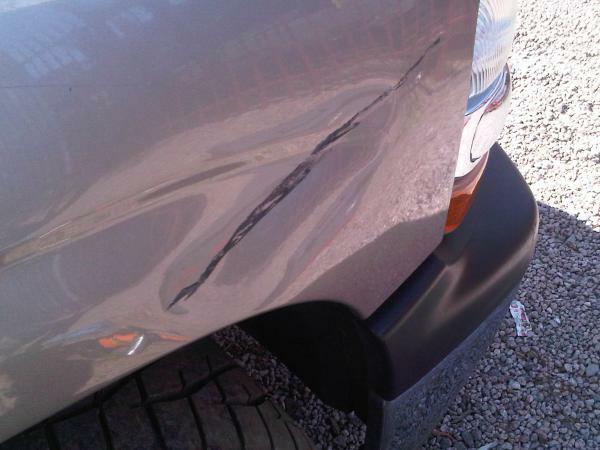 This was a simple dent on a body line and it took about an hour to repair. 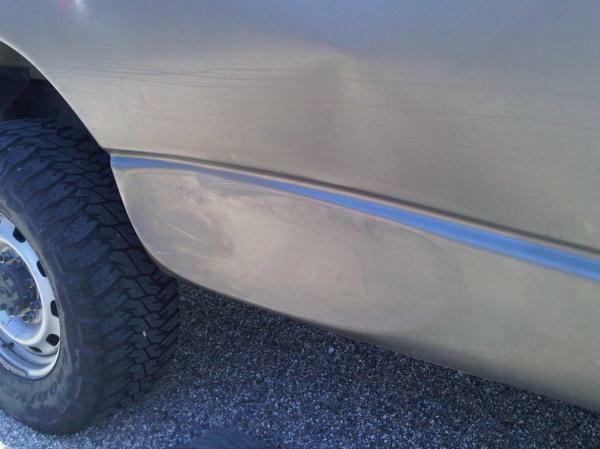 This dent was pretty big but took about an hour to fix and you can't tell it was ever there in the first place! 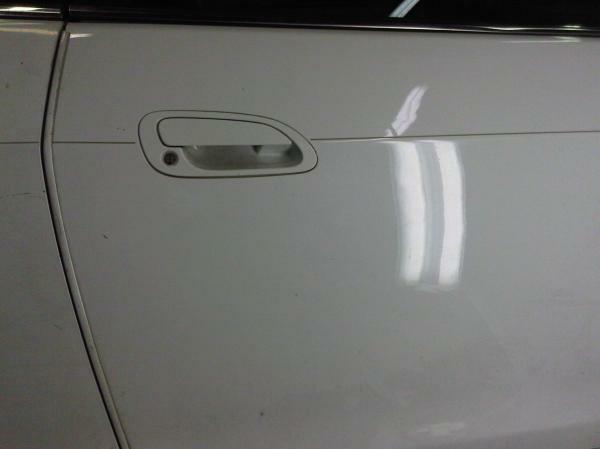 This dent was in a difficult spot as far as access, but I was able to make it look like new again. Something in the garage fell onto this hood and dented it. As you can see, it looks very nice after a quick repair! This was a nasty dent but after about 4 hours of work you can't tell it was there! 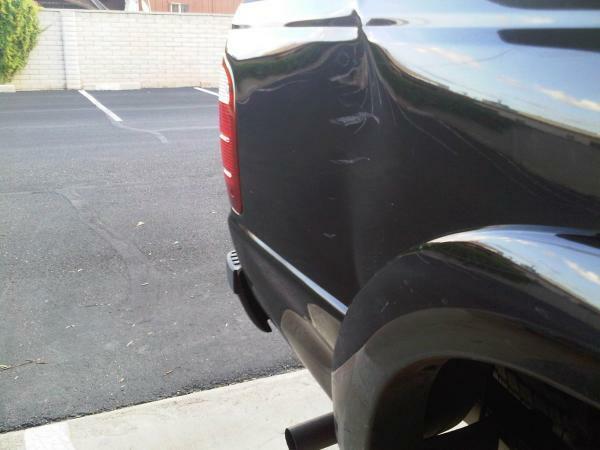 This deep crease occured from another car's side mirror rubbing the truck. 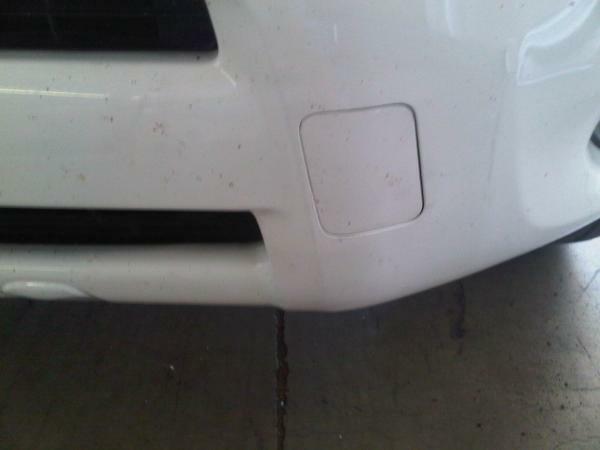 The black mark was plastic transfer from the other car. 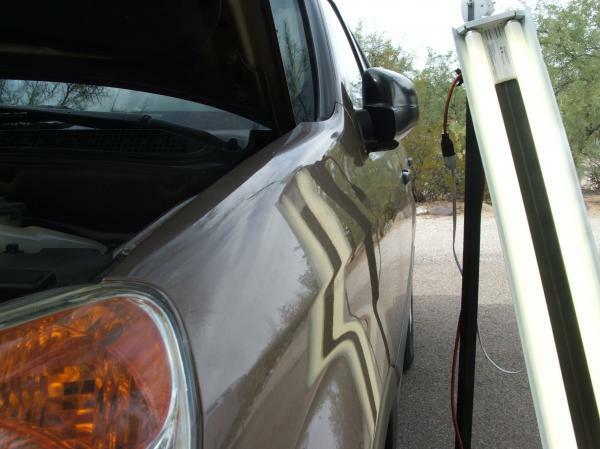 By removing the headlight, access to the damaged area became available. 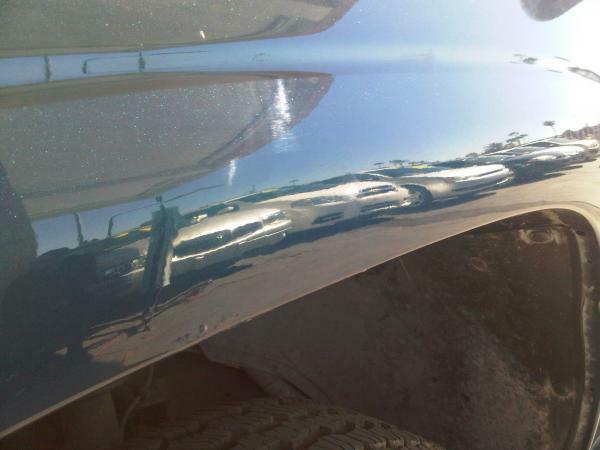 Paintless dent repair smoothed out the crease and a little buffing removed the mark making the Tahoe like new. 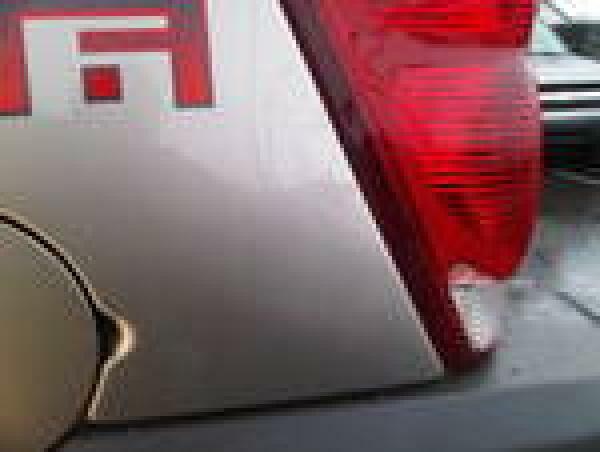 Front Bumper covers for most vehicles are made from plastic. 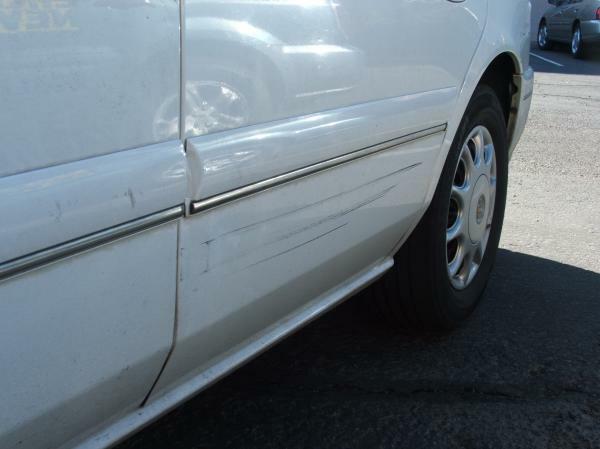 A dent in this area can cure into the shape, meaning that this type of damage should be repaired sooner than later. 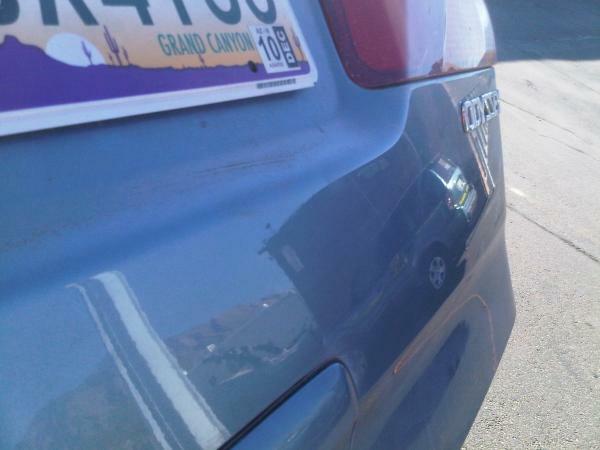 This large dent was repairable because we fixed it the day after it happened. 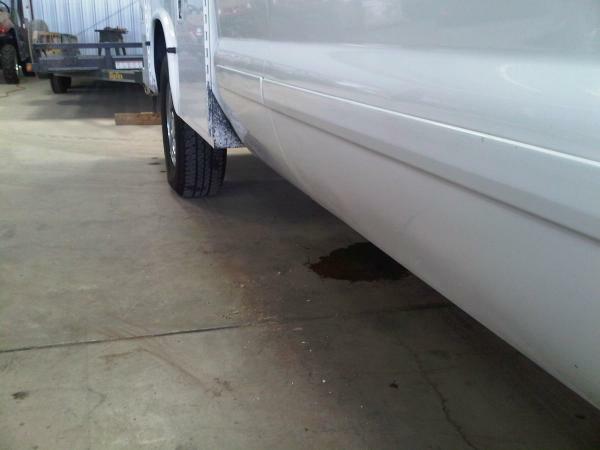 With buffing and touch up, we were able to save the existing bumper and the customer did not need to replace it. Occasionally when a truck turns, there can be an obstruction not visible from the driver's seat. 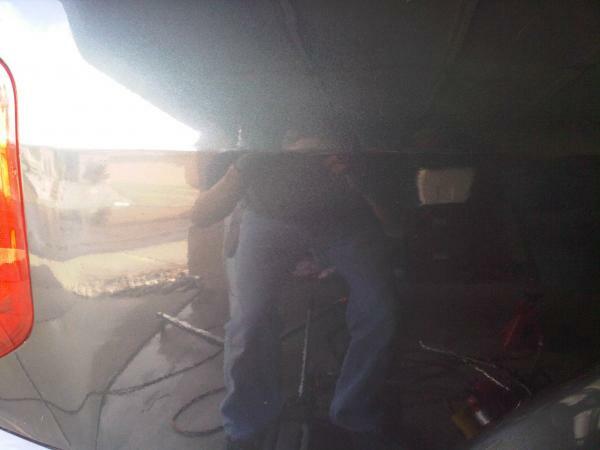 In this case, the quarter panel rubbed against such an obstruction. 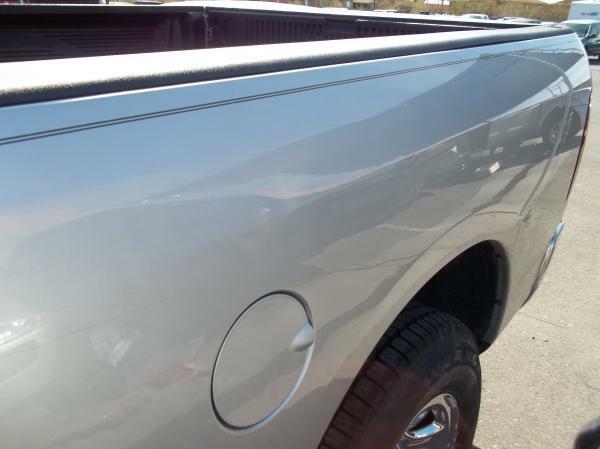 Paintless dent repair allowed the metal to be massaged back to original form while saving the existing paint. 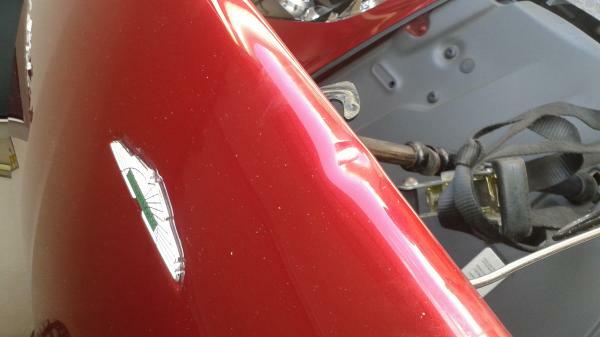 Large dents like this take a lot of time and patience to repair. This dent was a first for me. 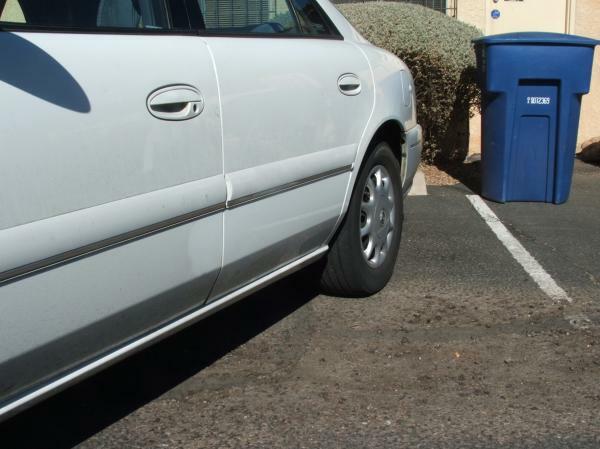 Often a dent in thick metal is unrepairable. 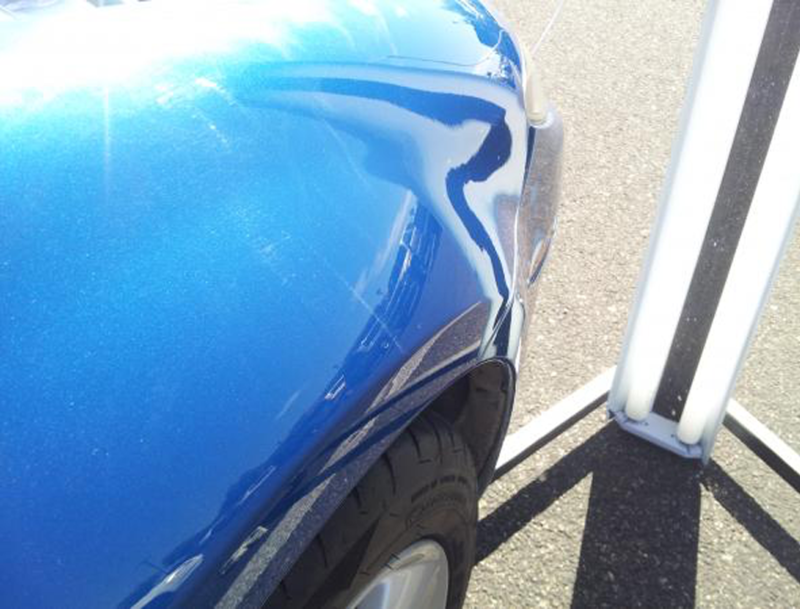 However, this damage was able to be smoothed out using paintless dent repair. Realigning the fender took 1 to 1.5 hours to straighten correctly and save the paint. 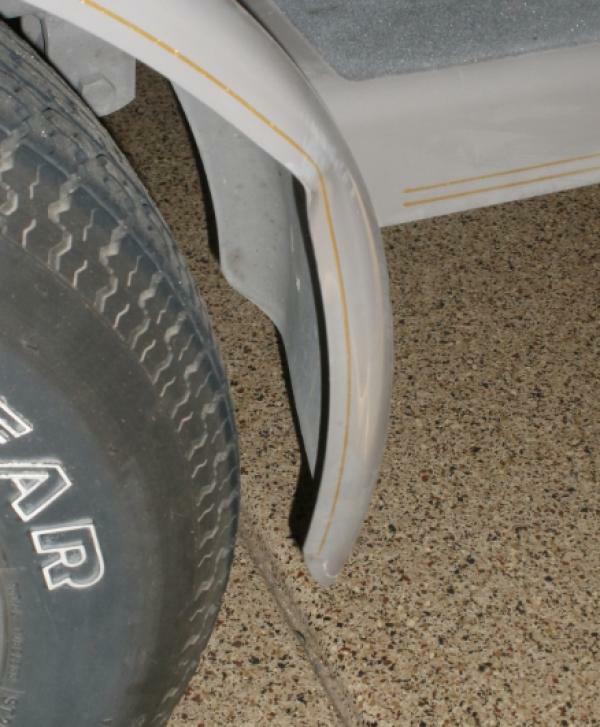 This crease is a good example of how deep dents and braced dents can still be repaired. 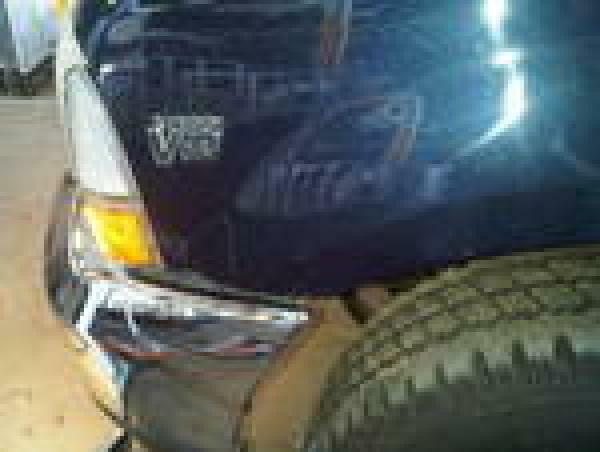 The damage was caused by another car swiping the truck with its side mirror. The crease went through a vertical brace area causing the 2 sharp outward marks in the dent. 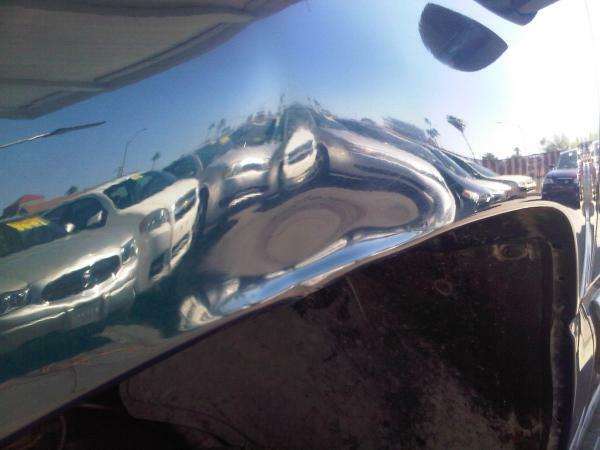 Paintless dent repair can reshape metal even in tight areas around bracing, while patience is needed for smoothing out deep creases. 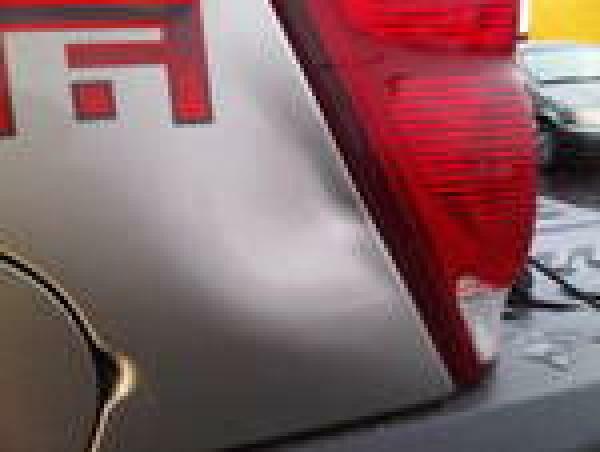 Large dents are repairable with patience. 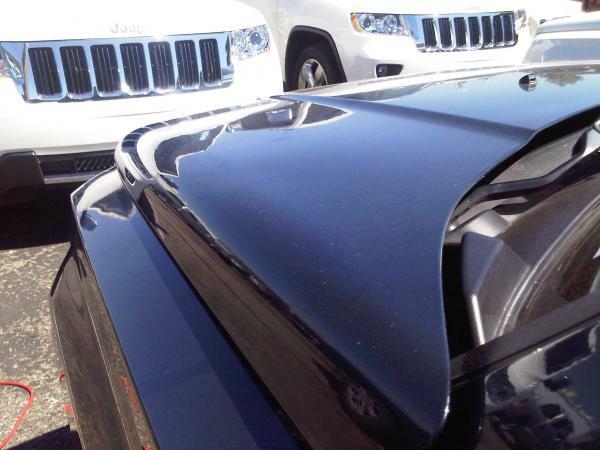 These large dents take a lot of time to reshape, but save a lot of money and time when repaired with paintless dent repair. 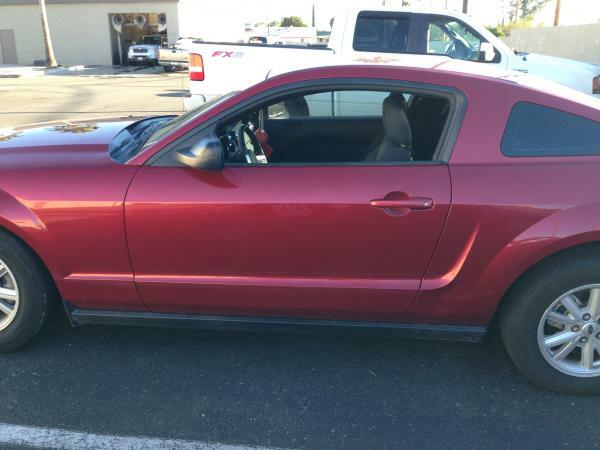 When you look closely, the fender does not line up with the headlight. Once the panel was realigned, then the dent could be reshapen. 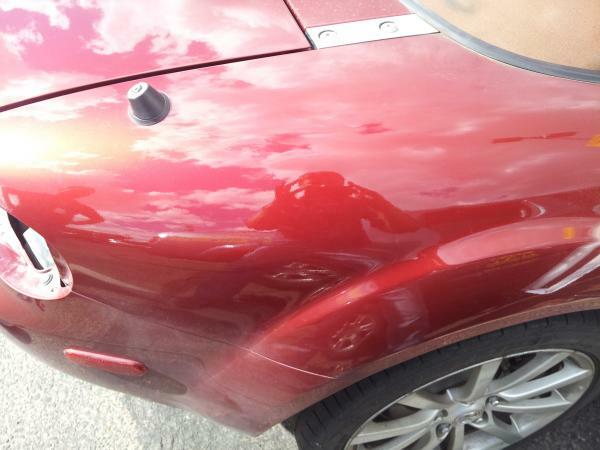 Paintless dent repair can be used to align panels and also smooth dents. This truck was hit hard in a wind storm. Luckily the taillight was not damaged. Although the paint has a small scuff, the metal can be straightened even on the edge of the panel. 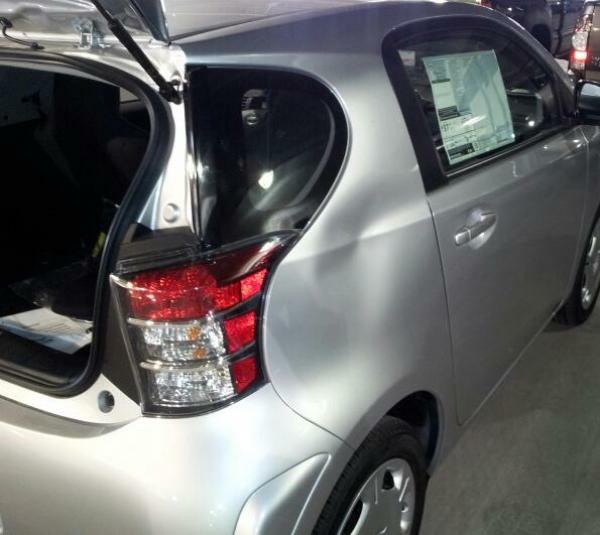 Occasionally a car can be dented from repeated pushing in one area, like closing a trunk lid. That is what you see in this picture. 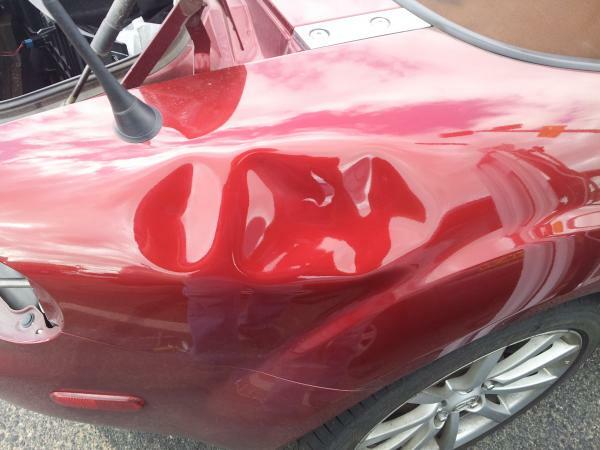 The paintless dent repair gives a smooth finish on all types of dents. 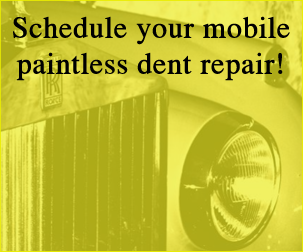 Big dents can be fixed using paintless dent repair. 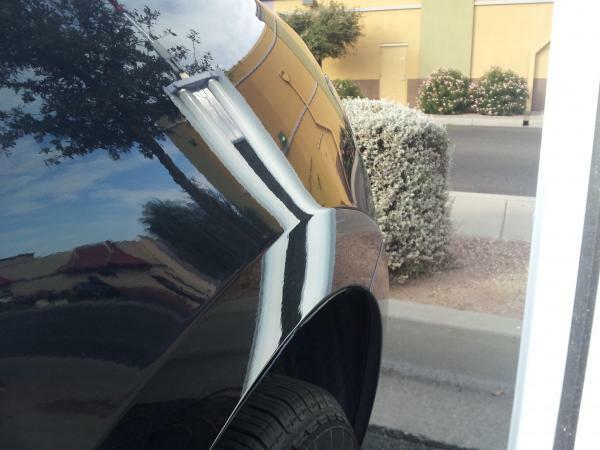 This dent took a little less than 2 hours to repair and now the whole car looks like a new car again. 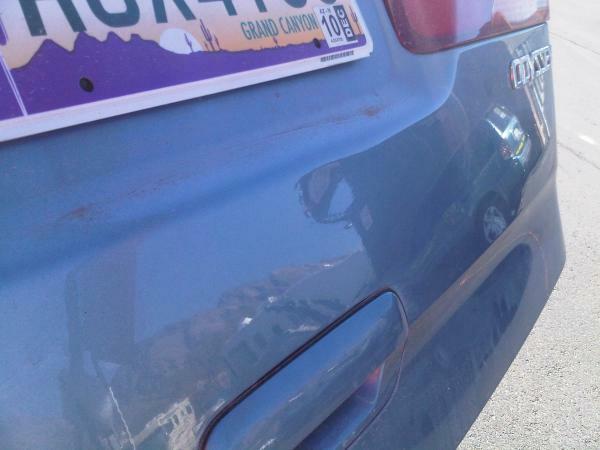 This creased dent occured when two car's bumpers rubbed togther in a parking lot. 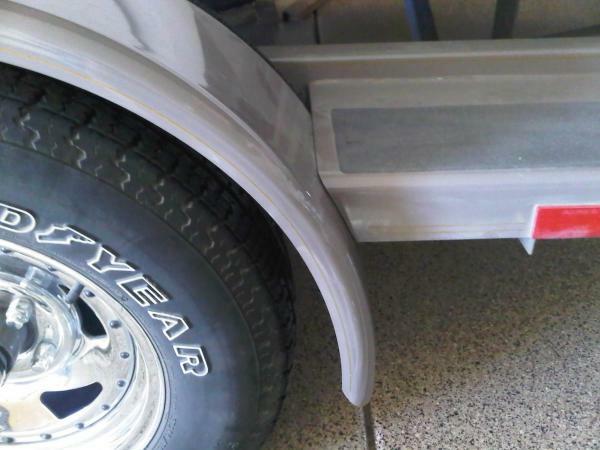 A lot of plastic bumpers will rub their own paint onto another vehicle. 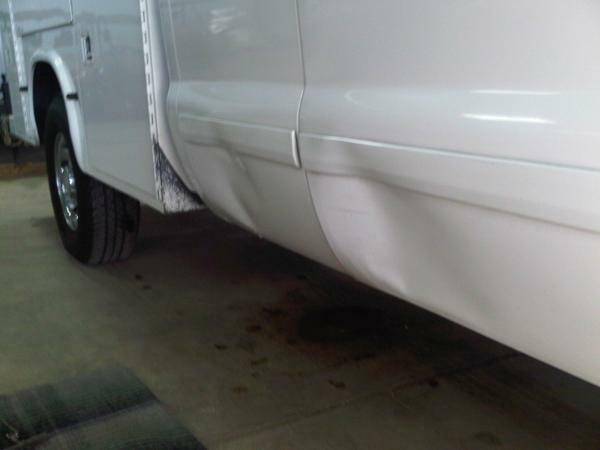 Working with the right solvents can remove the paint transfer and allow the dent to be completely repaired with no need for paint. 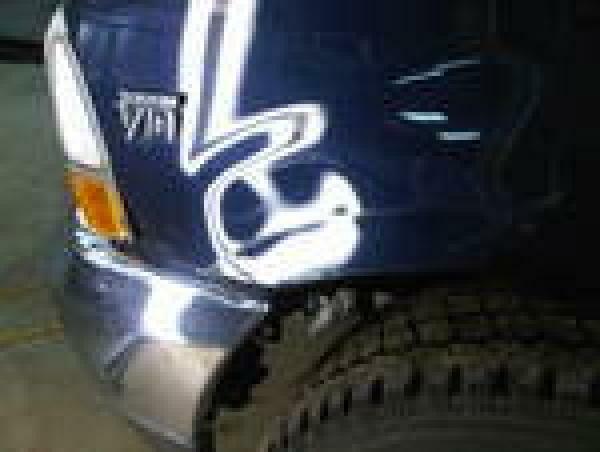 Vandalism can be fixed using paintless dent repair as long as the paint isn't damaged or cracked. 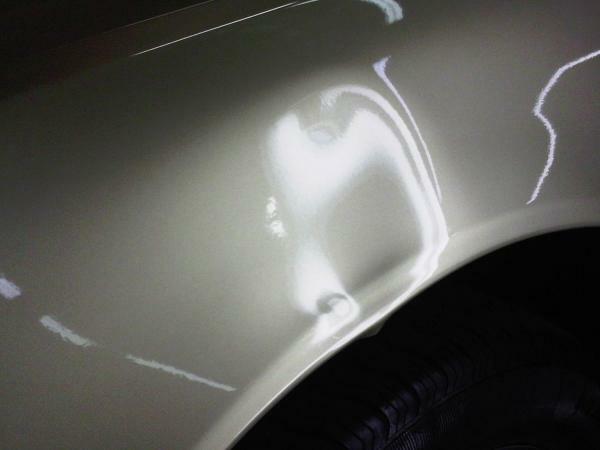 After removing the footprint with a cleanser, this dent took a little over 6 hours to reshape. 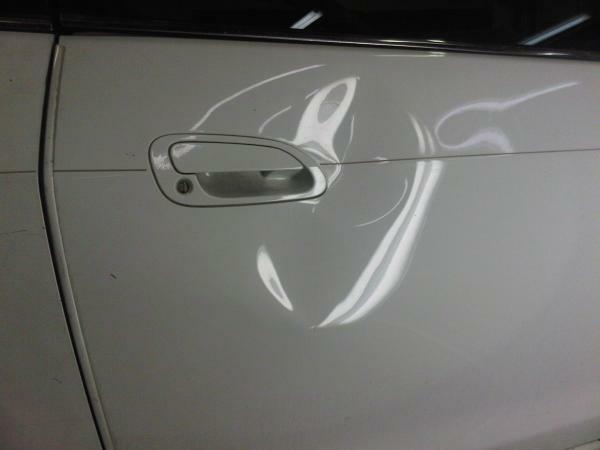 Some larger dents require more time especially when they occur around door handles, bracing or on edges of panels. This football shaped dent took about 2 hours to repair. GET TO KNOW US SOCIALLY!